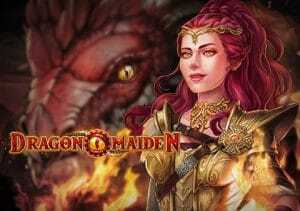 Super volatile fantasy-themed action is what’s on offer in Dragon Maiden. Created by Play’n Go, it’s a 5 reel, 243 ways to win video slot that comes with expanding wilds, re-spins and free spins with expanding wilds. Play on all devices from between 10p and £100 per spin. With a misty mountain range in the background, the reels are set within dragon scales. Joining the lower value heart, diamond, club and spade symbols are coins, daggers, rings and pendants. The best paying symbol is the Dragon Maiden which pays 12.5 times your bet if you land 5 on a payline. The Dragon Maiden symbol can magically transform into a wild at random. That’s not all. Any other Dragon Maidens on view will turn wild too. These wilds can also expand up to 3 symbols high which can really get the coins flowing. If you land 2 or more dragon scatters on the same spin, they are locked in place and the reels spin again. The re-spins keep on coming as long as a new scatter hits. This is called the Re-Spin feature. Land 3, 4 or 5 scatters in total and you’ll trigger the Free Spins feature – on offer are 8, 10 or 12 free spins. The dragon scatters gain some magical properties during the feature too. Every time 1 of them lands, it increases the height of that reel by 1. Each reel here can reach a maximum of 6 rows high. Land a dragon scatter on a fully extended reel and you’ll be awarded a Golden Free Spin. The Golden Free Spins feature takes place after your allocation of free spins is completed and play out on a fully expanded 5 reel, 6 row machine which offers a mammoth 7,776 ways to win. This fantasy-themed video slot is as fiery as a dragon’s breath. The variance here is as high as you’ll find anywhere. Your bankroll could go up in flames, but you could also bag an enormous payday, up to 5,000 times your bet per golden free spin. Magical dragons aren’t really among our favourite video slot themes. The super-hot variance makes Dragon Maiden worth considering though. If you like the fantasy theme, Playtech’s Raiders of the Hidden Realm cannot be missed.